Welcome to Egypt! Upon arrival in Cairo you will be transferred to your hotel. Cairo - Aswan. Start the day with a visit to Al Jizah, the famous Giza Plateau to see the iconic pyramids and Sphinx. 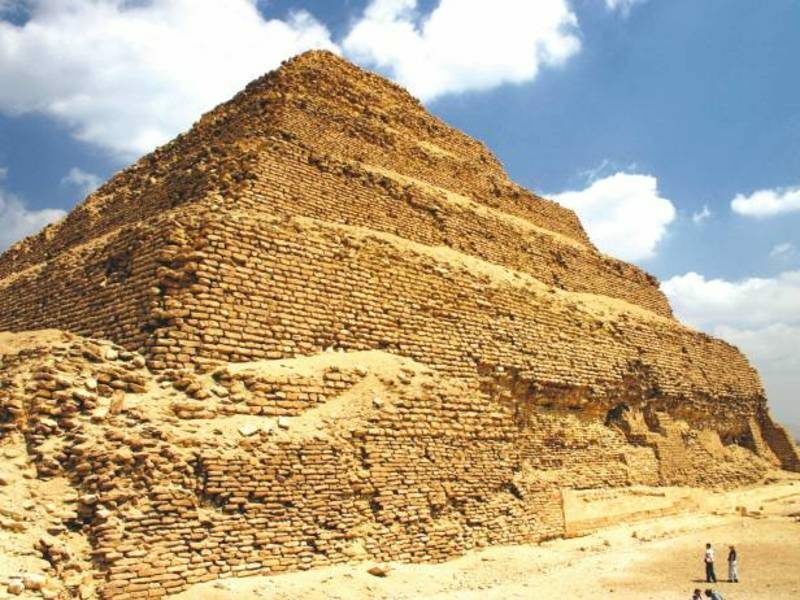 Next we explore the sand-strewn tombs and temples of the ancient necropolis of Saqqara, home to the Zhoser’s step pyramid. This evening we travel by overnight sleeper train to Aswan. Aswan. 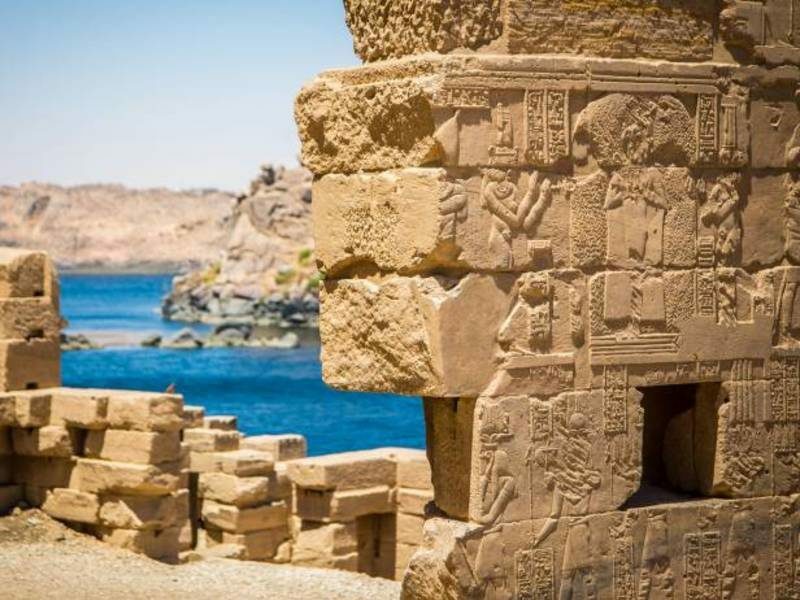 After arrival into Aswan and hotel check-in we enjoy a boat trip to Agilika Island where we visit the Temples of Philae, dedicated to the goddess Isis. Spend the remainder of the evening at your own leisure; shop in the colourful souqs or simply kick back and relax. Aswan - Nile felucca cruise. 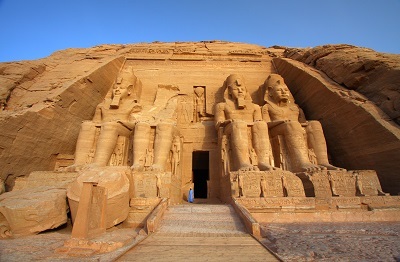 Early birds can go on an optional excursion to the majestic Temple of Abu Simbel. The gargantuan rock-cut temple at Abu Simbel was created to revere the mighty pharaonic ruler King Ramses II. Guarding the entrance to the temple, the four colossal statues of Ramses II sit majestically, staring out across the desert. In the afternoon we board a felucca for a 2-night journey downstream the River Nile, stopping at villages and islands along the way. If sailing by felucca is not your style, navigate the River Nile on board a 5 star Nile Cruiser with private cabin and ensuite bathroom. See our Nile Cruise Upgrade for more info. Spend a relaxing day sailing the Nile. Admire the views, go for a swim and chill out in the sun on deck. Let your troubles melt away, as the felucca plies its route. In the afternoon we dock near Kom Ombo and take a motorboat to visit the temple, which is dedicated to the crocodile headed god - Sobek, before returning to the felucca for the night. Kom Ombo - Luxor. This morning we disembark and continue to Luxor. Home of the legendary Valley of the Kings and Temple of Karnak, 4000 year-old Luxor is ancient Egypt at its best. Enjoy some rest and relaxation. Tonight, an optional visit to the Temple of Luxor is available alternatively, enjoy the facilities of our hotel. Luxor. This morning we explore the West Bank of the Nile and the legendary Valley of the Kings. 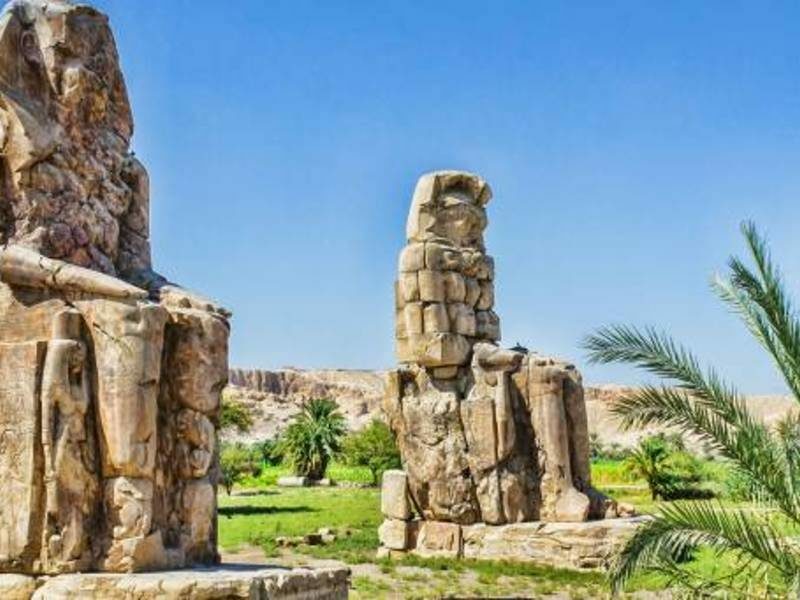 Marvel at Colossi of Memnon, the massive stone remains of the temple of Amenophis III, and explore the Temple of Queen Hatshepsut and surrounding tombs. After lunch we visit the Temple of Karnak, a spectacular religious complex built on a gigantic scale, where you get lost wandering around the stone papyrus columns. The rest of the evening is at leisure. Luxor - Hurghada. Departing Luxor we drive east to Hurghada part of the beautiful Red Sea Riviera for 4 days on the beach! 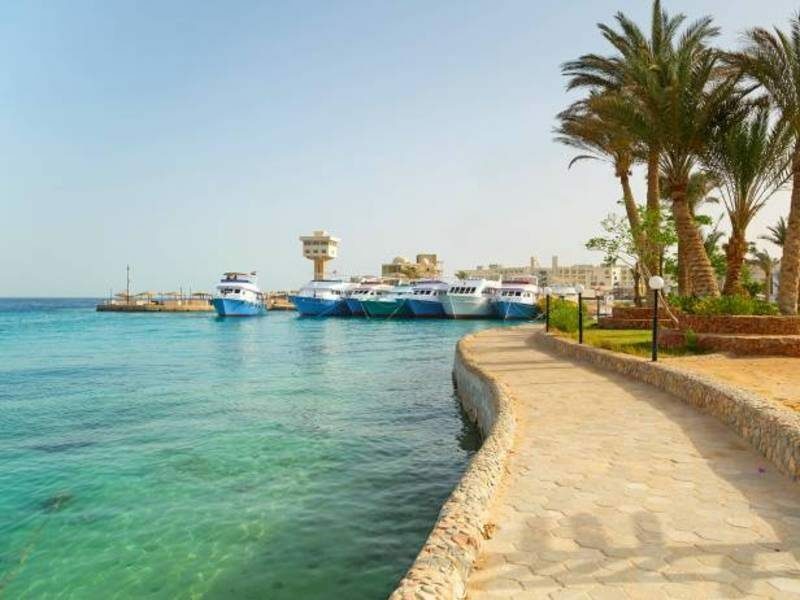 The next 3 days are free to explore Hurghada or simply relax. On day 9 there's an optional day trip to Giftun Island for swimming and snorkelling, which can be booked locally. Hurghada is one of the Red Sea's most popular resorts and it is easy to see why. Hotels and expanded infrastructure provide holidaymakers with excellent aquatic facilities for sail boarding, yachting, deep-sea fishing, SCUBA diving and snorkeling. Hurghada’s central location provides a gateway to prime offshore reefs, which are some of the finest in the world. Hurghada also has plenty of restaurants and late night bars for evening entertainment. Just outside Hurghada is an ancient Roman quarry called Mons Porphyritis and Port Safarga – a famously windy place which is ideal for windsurfing. Hurghada - Cairo. This morning we depart Hurghada and head back to Cairo. We take a guided tour of the enlightening Egyptian Museum, where you can see the famed solid gold death mask of King Tutankhamun and opt to visit the Royal Mummy room. Cairo. After breakfast, hotel check-out and onward transfer to the airport. Prices listed are per person twin share in Australian Dollars, based on twin occupancy, including all discounts unless otherwise stated. The offer is subject to availability at time of booking. Fares are capacity controlled and are subject to change at any time without notice. Prices are correct as at 9 January 2019 and can be withdrawn without notice.